It’s time for me to begin writing one of my shiny new Disney Trip Reports! It feels so long ago that we were starting out on our 5th trip to Florida, and with the grey skies outside, I wish we were back there now! If you haven’t read the pre-trip planning report yet, why not have a quick read now to bring you up to speed about who we are, and why this trip report is called WDW-40! Day zero is the unofficial start to our holiday. It’s the day that we travel to the airport, and stay in a hotel nearby. Flying again with British Airways meant that we stayed at the Premier Inn, Gatwick North which is located directly opposite the airport. Everything about the start of this holiday felt a bit strange! For a start, Liam wasn’t coming with us – so the day before he took himself off to stay with his Dad for the month. That left just Steve and I to have our first overseas trip together as a couple! We were also flying on a Sunday, so that meant day zero was a Saturday, and that Steve wasn’t at work. He could get Pumpkin into her cat box and take her to the cattery – I struggle with that task, and have always had to ask my brother-in-law to come and help me. And finally, my dad usually drives us to the airport – but we gave him a break this year, and took a cab instead. The drive to the airport was smooth, not much traffic, which is always a good thing. The same driver would be picking us up, so we paid the man, and bid him farewell until October! We went directly to the airport to drop our suitcases off at the British Airways desk. They have twilight check-in which is really handy, and one of a few reasons why we fly with them. The others being the price, and the fact that we collect their points which we actually used to take £200 off the price of this flight. With our luggage dropped off, we walked back across the road to check-in at the Premier Inn. I have written a full review of this hotel on The Purple Pumpkin Blog – my creative lifestyle blog – which you can read here for full info about Premier Inn, Gatwick North, but I will touch upon some details here too. Every time we have stayed here, we always seem to get a room that is furthest from elevators and amenities. I was not going to be able to manage the long walk on this trip, so we requested something closer. The receptionist was happy to help, and switched our room no problem. The rooms are across ten floors, and there are four elevators serving them. It can be mildly annoying trying to get a lift going in the correction direction! The Thyme British Bar & Grill, where both dinner, and breakfast are served. Costa Coffee, where you can also buy sandwiches, salads, cakes, snacks, as well as the usual drinks. There is just the one restaurant at this hotel, and it is advisable to book a table – which we did as soon as we were checked in. We then went up to our room to chill out before dinner. 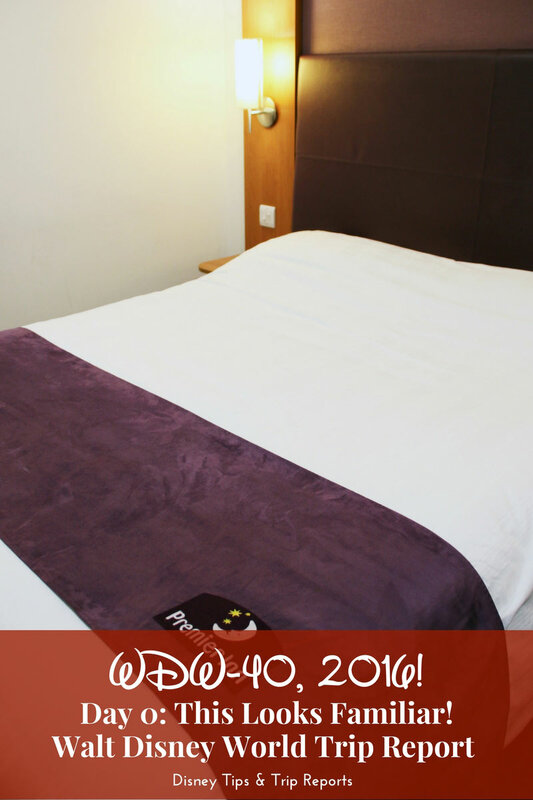 They are well appointed with a comfortable king size bed, extra pillows, sofa(bed), desk and chair, side table, television with Freeview, hairdryer, tea/coffee making facilities, and free Wi-Fi. The wi-fi is limited to a certain number of devices, but you can pay a small fee to use it on more than one device. There is also a unit with a hanging rail (and some hangers), a drawer and shelves; as well as plenty of space for your luggage. Everything in our room was clean and tidy. And the air-conditioning unit didn’t make too much noise (which can sometimes be a problem in hotels!). There are also black out curtains, and considering its proximity to the airport, you cannot hear the aeroplanes. Dinner time rolled round, so we took the lift down to the restaurant. We had an early booking – just after 6pm. I was glad we got in early as quite the line was building up as we were shown to our table! As part of the price we paid for our room, we could have a 2-course dinner – either a starter and main course, or main course and dessert. You can bump this up to a three course for a few extra pounds if you wish to do so. A drink is also included – either a pint of beer, glass of wine, or a soft drink. I decided to start with a classic prawn cocktail, and had a chicken and bacon salad for my main course. Steve had chicken wings for his starter, and a mixed grill for his mains. The food was delicious. I really enjoyed my prawn cocktail – they were nice big prawns, and not those wishy-washy tiny prawns you sometimes get in them. Steve really enjoyed his mixed grill, but said he wished it had come on a round plate instead of the rectangular one. We decided to forgo a dessert, and later returned to the Costa Coffee next to the The Thyme to grab an iced coffee and some cakes. We paid around £13 in total for the drinks and dessert we bought, and took them back up to our room as the seating area was really busy. We spent the evening with the television on in the background, while sorting out what we needed for our flight the next day. I hate rushing around on the morning of checking out, so would rather be prepared. I have a smaller bag (inside my handbag), that I pop essential flight items into. I can then place this in the seat pocket in front of me, and stow my bag out of the way overhead. I scribbled some notes down in my holiday diary for this trip report, and then it was lights out!